Very tacky Nano-Tech grip tape. Its surface structure confers optimal sweat absorption. Very handy. I love my racket even more now. Muy muy muy comoda. Just OK. Didn't work for me personally. Not a high sweat absorption material, but fair enough compared to its price. It's a bit misleading to call this "tape", instead of "wrap", as it has only one tiny sticky area, at the tip, to hold it in place, as the rest is wound around the handle. The only thing you get, to hold it in place, after you have it wrapped is the little black tape that comes with them, which is best applied to the overlap sections of your wind, to hold everything in place. It's perfectly fine, but I'm just picky, and would like yo have the grip "tape" itself be a little bit adhesive, or at least have more adhesive sections on it. Se hizo bastante ancho mi mango sin embargo por otro lado lo cubre perfectamente teniendo buen agarre y absorbiendo la humedad a la perfeccion. No tengo punto de comparación, sin embargo me gusta mucho más la sensación del mango de mi raqueta con este grip que sin el, siento que tal vez viene un poco más largo para que lo puedas cortar de acuerdo a tu gusto, la primera vez que lo puse me quedó el mango muy gordo, así que lo corté y ahora es muy funcional, ya no tengo el problema de que el mango de mi raqueta se sienta sudado y mejora el agarre. It absorbs sweat to some extent. this the first time I use it, I like it in the first time, however, as old-traditional player I didn't like later. But in general it is good. each one is long enough to cover to paddle. This tape sticks tight, does not loosen, and is easy to wrap. It worked so well that my Chinese coach asked where I bought it. Very comfortable grip I would buy it again. Produto excelente, qualidade comprovada com preço justo. If you have sweaty hands, this is a must. Nice and comfortable. Really long and could cut to use on 2 handles per tape. The quality is good, but it's so thick I think this is for tennis racket not for table tennis. 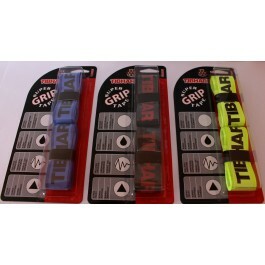 Thibar grip tape is an excellent product. 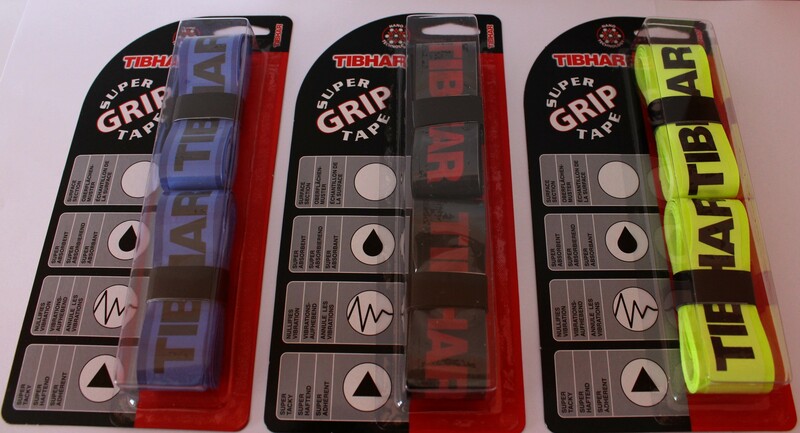 Gosto do TIBHAR SUPER GRIP TAPE, pois você sente mais firme a raquete na sua mão e ainda protege sua raquete. I do recomend Tibhar grip tape, good value. Очень хорошие обмотки, в упаковке 2 штуки. Обмотка понравилась, в упаковке две штуки. Totally agree with the comment of JCP from 15.02.2015. I was wary of using tape, but my bat handle was too thin. I was concerned that the extra grip might make twiddling more difficult, it's the opposite, the extra grippiness means I can twiddle faster and with more accurately an extra bonus. I wrapped nice and tight to get a lot of extra thickness and still there was plenty left for another racquet. I thought I might need to double the thickness but it is fines as it is. It comes with two pieces, and each is long enough for two paddles. Comfortable and good quality. Good service too.